BEAUFORT - A small cannon recovered from the 1718 shipwreck of Blackbeard's flagship, Queen Anne's Revenge (QAR), will be on display for the public in late February at the N.C. Maritime Museum in Beaufort. Other newly restored artifacts to be added to the museum's ongoing Blackbeard exhibit include a pewter decorated wooden knife handle, cannon wadding, and a hand grenade. 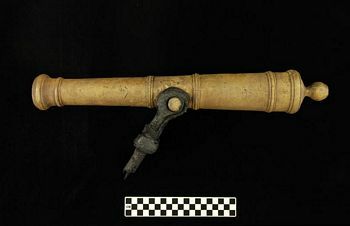 "The 19-inch bronze cannon possibly was used as a signal gun to warn victims of the pirate ship's presence or as part of combat," explains nautical archaeologist David Moore, with the N.C. Maritime Museum. "In fact, there is evidence that the cannon was well-used, as the vent had been worn from explosions and was replaced by the crew." Currently 300 individual artifacts are in the Blackbeard's Queen Anne's Revenge exhibit in Beaufort. Other Blackbeard artifacts can be found at the Graveyard of the Atlantic Museum in Hatteras, the N.C. Museum of History in Raleigh, and the Smithsonian Institution in Washington, D.C.
housed at East Carolina University in Greenville, where students assist professional staff with restoration work. The Queen Anne's Revenge Shipwreck Project and the N.C. Maritime Musuems are within the NC Department of Cultural Resources.